Snow today was a big surprise this morning when my husband brought me a cup of coffee and opened the window blind. Some parts of the US are measuring snow in feet this year, but we had about 3 inches—maybe 3-5 inches more tomorrow night. Most schools in the area cancelled classes due to unsafe road conditions. The local garden club follows the school schedule for inclement weather, so our monthly meeting was also cancelled today. That left my morning free to enjoy the snow falling and watching the birds vying for position at and around the feeders. I had to run out first thing to fill both feeders, which have been quite the popular hangouts lately. It is frustrating to try to get good images of the birds with my camera but there was such a gathering of species I could not resist trying. This video gets off to a slow start, but eventually shows a few of today’s visitors, starting with an Eastern Bluebird. 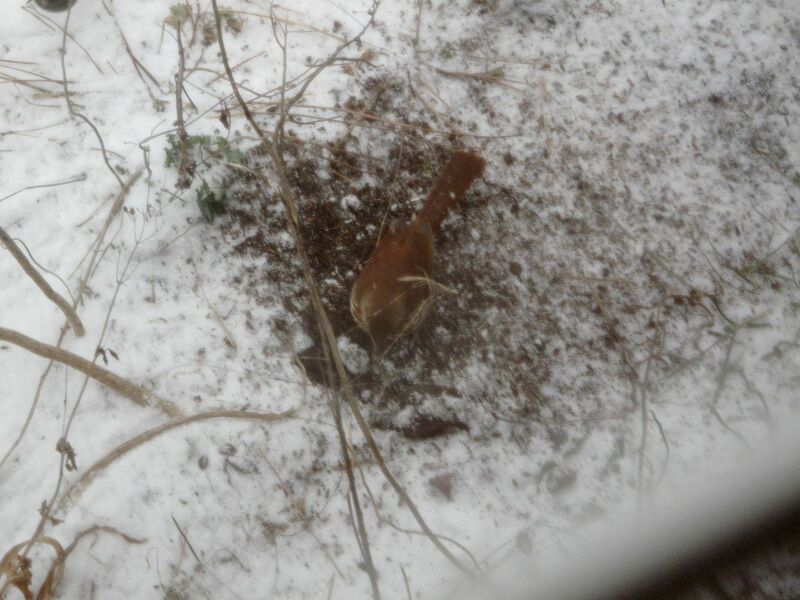 This entry was posted in garden and tagged birds in the garden, winter garden on February 24, 2015 by pbmgarden. I enjoyed your lovely photos of the birds in the snow…very unusual weather for you there. Thank you. It was great fun watching the birds yesterday. February is often when we get some snow or worse, ice. P.S. Congratulations on your 500th post! That’s an accomplishment! A lot of lovely members of the flock you have there. Are you being robbed by the rats in fur coats as well? We have plenty of them up here and they are very cleaver and undeterred by any obstacles. Thanks Pris. The squirrels haven’t been too bad lately. They can’t get into these feeders but they do learn to jump up on top a byway because when they fall off some seeds will shake to the ground. At least the birds don’t seem deterred by your cold spell! Hope it warms up soon! P.S. Congratulations on your 500th post Susie! Thanks Cathy. Wonder why we humans like numbers that end in zeroes. The birds don’t get much rest this time of year. They seem to feed constantly. I expect the activity keeps them warm! 500 posts! That is quite some achievement. Well done Susie! Thanks Jessica. 500, but who’s counting? Thankfully, WordPress is. Congratulations! Thats a lovely post to celebrate your 500th post Susie, even if it was snowy. I loved your video, watching birds is so relaxing. Hope the snow does not last to long though. Thanks for watching my little home movie Julie. I had some more interesting birds to share but editing the footage became such a time sync I just stuck with that one clip. Hooray for 500! I’ve always heard that bluebirds don’t visit feeders, but I’ve seen them take seed the last two years. By the way, I drove through that snow yesterday, traveling home from a quick trip to see my mom in Virginia. Looks like we might get more tonight. And then, praise be, a warming trend. Maybe spring will come at last. Thanks Marian. 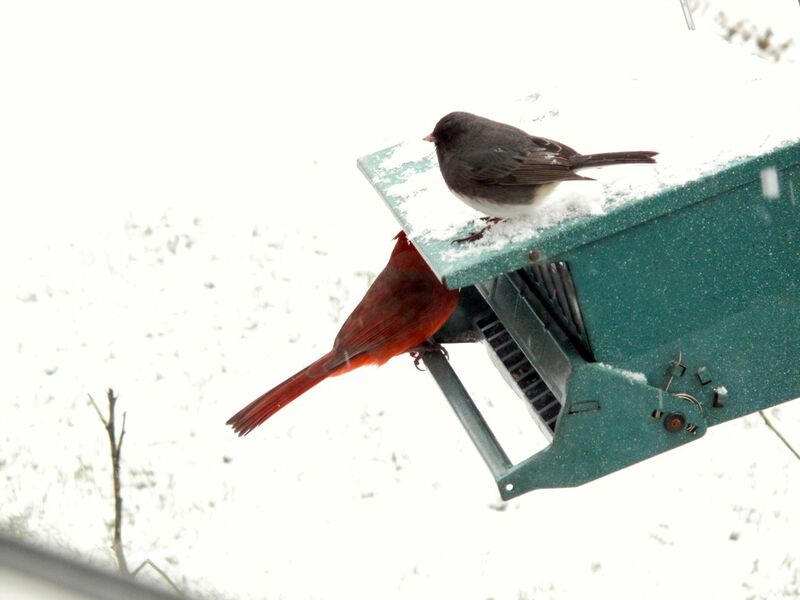 I’ve heard that too about bluebirds but they’ve always been happy to use ours especially during winter. And they will not think twice about pushing the cardinals out of their way. Glad you made it home safely from VA. My sister at Cherry Grove said they had bad ice. Oh, the promise of spring. Thanks Judy. The cardinals and bluebirds do add some nice splashes of color to the garden. Congratulations on your 500th post. How long have you been blogging Susie? I’m sure the birds appreciate all the attention especially with snow. Lovely images. I’ll watch the video when I get home to the pc. Thanks Christina. My first entry was January 7, 2011, all about plans to regenerate the garden. That is a lot of posts, well done Susie, you have shown dedication. Awful to have more snow but your gorgeous birds are a consolation. The birds are great fun to share the garden with. Happy 500th post Susie….and 3 inches is like a foot here….amazing how resilient birds are…ours endure so much snow and cold. Great shots. Donna thank you. I promise I’m not interested in catching up to your levels of snow, but we are expecting another 5-8 inches tonight. Boo. “500, but who’s counting? Thankfully, WordPress is” -haha, I loved that! I’m surprised by the variety of birds which come to your feeder. 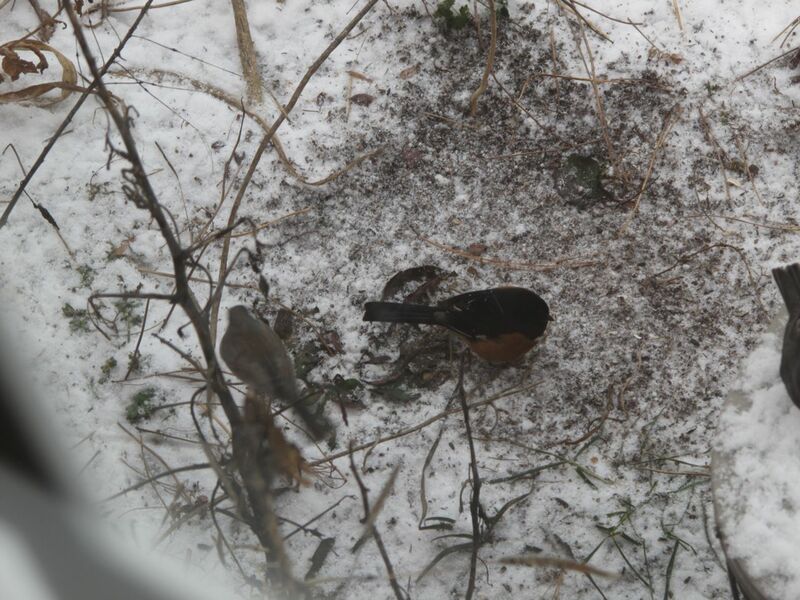 The towhee and thrasher are cool to have, but the bluebirds and the little warblers in the video are a surprise! Nice. Congrats on your 500th post. That’s quite an accomplishment. One benefit of the bad weather is we’re all hanging out watching the birds. Thank goodness for the birds. Thank you Stephi! It will be nice to be able to join the birds in the garden once the weather improves.